Prevent a Frozen Fur-Baby: Cold Weather Tips! I love winter. The escape from the hellish southern humidity is welcome all day around here, and we've got piles of doggy sweaters to turn every day into a frosty fashion show! That said, just like in summer, the temperature extremes take a little extra pet-parent-prep, so we've put together a few tips to help you and your furry enjoy this time of year safely! 1. SWEATER Weather! Go on and buy that jacket you've been eyeing - this is one time where your non-dog-parent friends better not poke fun at you for dressing up your little one! 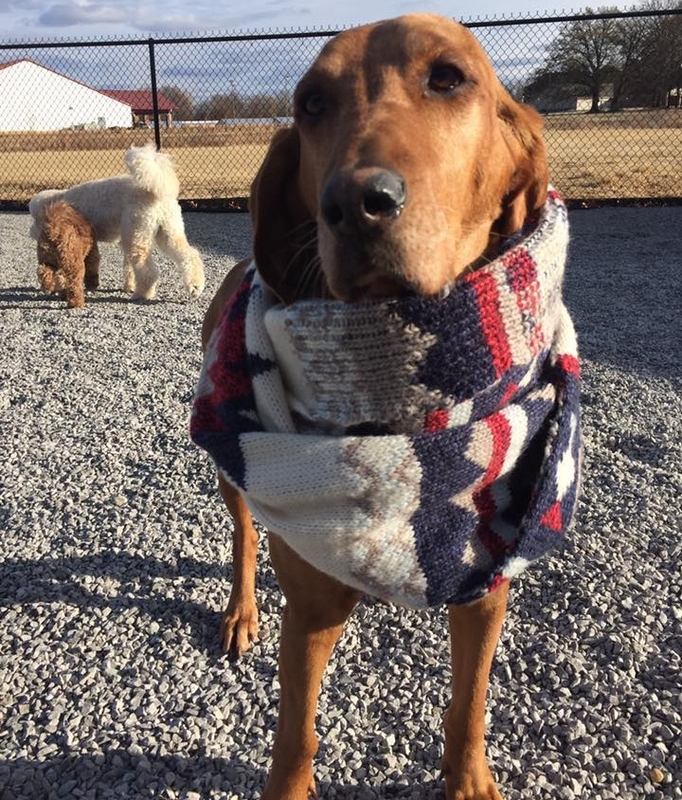 There are certain breeds that really do need the extra warmth - weimaraners, greyhounds, chihuahuas, and dogs with naturally thin coats are obvious, but if you're a doodle, poodle, or terrier parent who keeps your pup's fur groomed short, you may want to get in on the winter fashion too! On the flip side, if you're parenting a Newfoundland, Great Pyrenees, Samoyed, or even a German Shepherd, save your sweater money - thanks to their double coats, they don't need anything else! In fact, an extra layer could even cause them to overheat. 2. PAW PROTECTION! I have to say, this is one topic we know a lot about. In the off-leash play world, newbies will often experience a cracked paw pad from the increased activity (ladies, imagine standing in heels for 8 hours after you've sat behind a desk for 3 years - YIKES to the feet! ), and the cold can cause some of the same. We swear by a product called Musher's Secret. It's from Canada and was made for sledding dogs. We keep it in our first aid arsenal year-round. It may have been made for the cold but I also think it's great for summers here too - hot weather can be even more damaging to those paws, so any kind of barrier protection is essential to have on hand if you like taking your dog on walks! 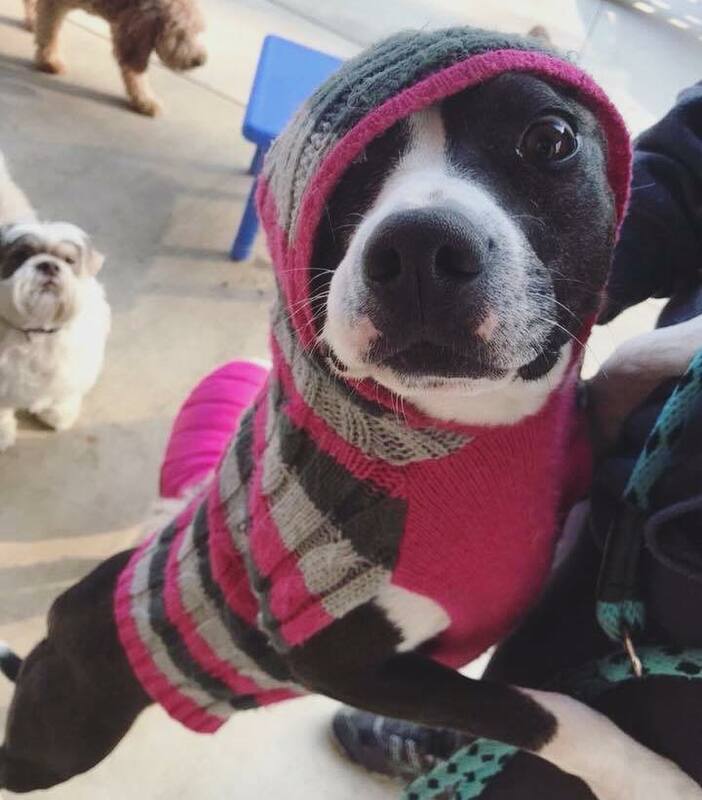 Boots and booties are cool too, but in the South, where we only experience cold for a short time, I find that the dogs are more freaked out by them than anything and by the time they actually get used to them, winter is over. If it's something you're considering investing in, I like the ones made by Ruffwear. 3. EATING AND EXERCISE! If you're still keeping up with your regular doggie daycare routine (yay! ), you may want to increase your pup's food allowance a bit. Even if their activity level is about the same, playing in cooler weather uses more energy. Same goes for those who still maintain a regular walking or jogging schedule. If your exercise routine is different and typically just includes playtime in the backyard, make sure you're doing your part to provide indoor exercise options for your pet during this time (my dogs chose to "exercise" by shredding and chewing up all the Christmas ribbon). Treat dispensing toys are a favorite. I love the IQ Treat Ball - it's simple to understand and easy to fill. 4. WATCH OUT FOR CHEMICALS Antifreeze is one we all know to steer clear of, but raod salt and other de-icing products can also cause problems. Remember, your dog is probably going to lick his paws after you come in from a walk, so he could ingest chemicals just as easily this way. Beat him to the punch by wiping his paws off with a towel every time you come inside. 5. JOINT CARE: Sort of like humans, the cold may affect senior dogs or those with arthritis more than others. Consider orthopedic bedding or a joint supplement, or check your dog food label to make sure it includes vitamins that will help promote joint health. These pets may not like going for walks in the cold, so believe it or not, this might be a good time to keep them involved in doggie daycare. Typically even if they don't "play" with other dogs, the stimulation peaks their interest enough to get them up and moving more than they would at home, and indoor (heated) playrooms allow them to maintain movement in a comfortable space. Oh my housebreaking stars, we feel you on this one. I'd swear a third of the completely housetrained dogs that come stay and play with us suddenly forget their potty manners as soon as they find an indoor fencepost around here! Since pee cleanup is a way of life in the doggie daycare world, the last thing we fearless Pack Leaders want to do at home with our personal dogs is MORE PEE CLEANUP. So, while we may not have mastered the art of not barking at squirrels, most of us HAVE picked up a few sanity-saving tricks that keep our human houses pee-free! We hope they help you too! 1. We use the same door to go outside. All the time. Going to potty? Use THIS DOOR. This is the first step in getting your doggo to gooooo to the place where he knows you take him out to do his biz! 2. We use positive reinforcement from the get-go! Even if your puppy is a little young to accomplish full housetraining, you can still celebrate the small wins right off the bat. Pottied outside? "GOOD BOY!!!!" and here's a *secret hint:* save the extra-super-special-secret treats for potty rewards. Treats are awesome, but save the REALLY good favorite ones for when he goes potty outside for you! This also works well if you're dealing with a new rescue dog that may be recovering from a less-than-stellar past life, and you're trying not to throw too much at him at once or trying to help him build his confidence and trust in you. 3. We make wide open spaces. YES we know the luxury of a fenced yard isn't something everyone has, but a small investment in a SUPER long lead (like 30 feet) might work wonders in giving your dog that little bit of breathing room he needs to get the job done (privacy please mom!). Tethers and tie-outs can help here too, but we never recommend leaving your dog on one unattended. We like this leash! 4. We call them out when they mess up...IF we catch them in the act. A simple "no" is all you need, and take your pup straight outside. They're smart and they know when you're disappointed - don't make a big dramatic scene over the accident. For the record, rubbing their nose in it later is stupid and will not fix your problem. Dogs live in the moment, they don't remember that they peed there two hours ago and they learn nothing from being punished for (in their mind) no reason. 5. We don't use puppy pads. It's SO tempting, we know. BUT making it OK to go potty inside in ANY way is just going to derail all the hard work you're doing. You're trying to HOUSE train them, not "only-pee-in-this-one-spot-still-inside-the-house" train them. Don't confuse them - focus on teaching them the difference in indoors and outdoors! 7. We use appropriate timing. Heck yes you should be taking your 8 week old puppy outside every 30 minutes, but as the days pass on it IS okay to start giving them the opportunity to learn how to hold it. Try crating for small increments of time here and there, especially at bedtime and overnight. Someone told me once that for every month old the puppy is, that's how many hours he could probably hold it (2 months old = 2 hours, make sense?). I watched this theory play out a bit with my two 5-month old beagles, and I have to say I think it's a fair guideline. Mine progressed a little faster in the overnight department (they were able to be crated through the night by 11 weeks) but during the day, if I needed to leave them crated right now, 5 hours is about all I think I could expect from them (at 5 months old). 8. We learn their cues. We hope you are a fortunate soul whose dog gives you a super obvious bathroom cue like going to the back door. If not, though, watch for the behaviors they display just before a potty. Barking? Sniffing the ground? Dancing? Running out of the room? All things that could mean POTTY time - and it's our job to read the cue and use it as an opportunity to take them outside, where we'll hopefully celebrate them going potty in the correct place. FINALLY...even if you're a pro, there will be setbacks and accidents. One way to minimize these is by using a legit cleaning product to take care of those messes. We 100% believe the best products for cleaning floors and carpets are those that are enzyme-based. Dogs explore the world with their nose, and it IS true that they'll go back to that spot on the rug where they had a previous accident if it isn't cleaned up thoroughly. This is one we really like. JONESBORO - back to our roots! If you're following us on Facebook and Instagram you've hopefully seen some pics and video of the construction progress happening at our second location in Jonesboro - in this post we want to tell you all about the humans caring for your hounds, including the happy announcement of the newest Operations Manager to join our pack! There really aren't words (or barks) to articulate how it feels to be bringing Hounds' Hideaway to Jonesboro. Since December 2015 we've been operating down in Conway, and I have to tell you that the Pet Parent community there is the stuff doggie dreams are made of - they've given us constant love, ideas, and feedback - all things we hope will make location #2 in Jonesboro everything you're hoping for! It's funny, even though Hounds' Hideaway first started in Conway, it's been tied to Jonesboro since long before. When we came up with the idea for the facility, we were new residents to Conway and only had a hunch it might do well in that community. So, we called up some good friends at ASU to help us cipher through hoards of data and make sense of our business plan. Oh how grateful we will always be to the graduate students and faculty in the College of Business and the ASBTDC for their help getting us to the big decision of, "ok YES this might actually work!" Anyhoo, back to the point - the people! Jonesboro, you are getting a gem of a human to lead the pack that takes care of your furries. I'll be your Head Human (that's me holding the beagle in the pic up there) and no doubt we'll cross paths, but we know how important it is to have a lovable local there for you all day every day, and we think our newest human Hailey Knight is the perfect lady for you and your fur-kids! Hailey is also a Jonesboro native and ASU grad, and for the last few years you might have recognized her as the face of downtown. She's been the Executive Director of the Downtown Jonesboro Association, leading the charge to make downtown an awesome place to live, work, shop, eat, and play. You may not know, though, that when Hailey isn't downtown you'll likely find her wearing her other hat as a professional pet sitter to many of Jonesboro's 4-legged residents, and being mom to her two guinea pigs Oreo and Miss piggy! She and her boyfriend Jeremy also have an adorable kitten, Bootsie, that you'll definitely want to meet too. We are so excited for Hailey to be the face of Hounds' Hideaway (and speaking of face that's her up there in the photo with the Guineas!) and so thankful to have someone who shares our passion and vision for super cool pet care running this new Jonesboro show. 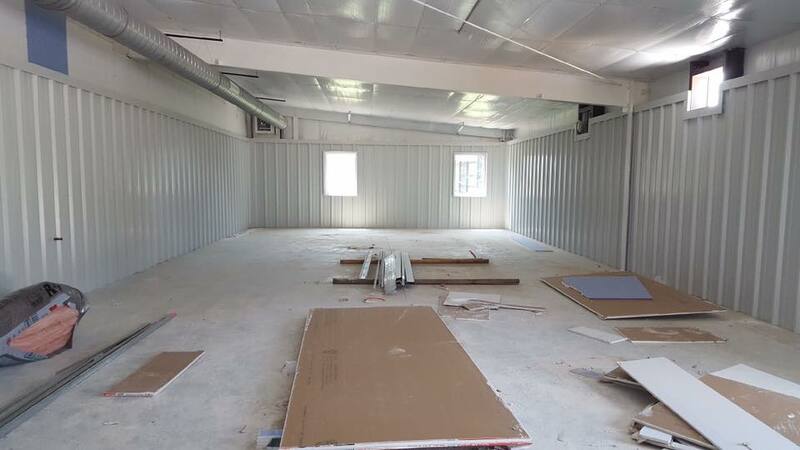 We're getting SO close y'all - construction is wrapping shortly and then we'll be busy bees filling the facility with everything we need to create hound happiness! Our official opening date isn't set yet, but we know it'll be in October! If you want to be the first to know about private parent events and open (dog) house events, join our Hounds Hideaway Pet Parents - Jonesboro GROUP on Facebook. We so appreciate your support thus far and can't wait to open the doggie doors!